﻿In Prayer and Laughter. Essays on Medieval Scandinavian and Germanic Mythology, Literature, and Culture is the culmination of a lifelong study of the Middle Ages by Anatoly Liberman, an internationally acclaimed medievalist and linguist. It contains an introduction, 21 chapters of different length, a bibliography, and indexes. The book opens with a bird’s-eye view of the state of comparative mythology and proceeds with an analysis of the most important questions confronting a student of Germanic and Scandinavian religion. In his exposition, be it the characters of the Scandinavian gods, the creatures of lower mythology (such as dwarfs, trolls, and all kinds of devils), the nature of ancient rituals (such as initiation), shamanism, the origin of the runic alphabet, or the function of mythic animals, Liberman combines attention to detail with a broad view of the medieval world. His keen interest in the large picture is noticeable at every step, and he never loses sight of the methodological aspects the humanities pose (the use of structuralism beyond linguistics, among others), the idiosyncrasies of “the medieval mind,” and the limits of reconstruction. Since the author feels equally at home in mythology, linguistics, and literature, his book can be called philological in the best sense of the word. 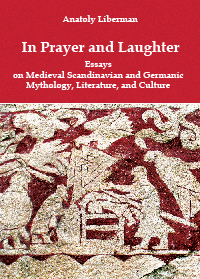 His studies on the prehistory of religious concepts, etymology, and the origin of folk beliefs go all the way from the “career” of the greatest Scandinavian god to the development of the sense of humor and the psychology of the medieval narrator. Every chapter contains an exhaustive treatment of everything said on the chosen subject and offers an original, often controversial solution of the problem. This book will be interesting to students of Germanic, particularly Scandinavian, and Indo-European culture and to everybody who would like to know how the mentality of the Germanic speaking people developed over time. The bibliography that covers the scholarly literature for two centuries will become an invaluable source of information to wide circles of scholars, while detailed indexes will give them immediate access to the problems under discussion. Those include not only what the titles of individual chapters promise but also references to such names as Shakespeare, Dickens, and many others, whose appearance in a book on medieval themes could not be expected. Anatoly Liberman, born and educated in the former Soviet Union, has been a professor of Germanic philology at the University of Minnesota since 1975, where he has taught all the Old Germanic languages and literatures. As a graduate student, he studied phonology under the guidance of M. I. Steblin-Kamenskij but soon added medieval literature to his area of expertise. He was the editor of the first translation of Beowulf into Russian. In the United States, he also became active in folklore, poetic translation, and literary criticism. He is the author of nearly 600 publications. Among his most important books are Germanic Accentology: The Scandinavian Languages, Word Origins… and How We Know Them, An Analytic Dictionary of English Etymology: An Introduction, a three volume edition of N. S. Trubetzkoy’s works, annotated translations of Lermontov’s and Tyutchev’s poetry, and two award winning books: an edition of Vladimir Propp’s works on the history and theory of folklore and A Bibliography of English Etymology.